WASHINGTON — Nancy Pelosi, the highest-ranking woman in the history of US politics, was re-elected on Wednesday to lead congressional Democrats, a major step on her march toward once again becoming speaker of the House of Representatives. At 78, Pelosi is seeking to reclaim the gavel that she first wielded a dozen years ago, when she became the first female speaker of the House. In a closed-door vote, Pelosi earned support from 203 members, while 32 critics voted against her and three members reportedly left their ballots blank. Facing the most serious challenge of her tenure as leader, Pelosi will have work to do to unify the party ahead of a House floor vote for speaker on January 3, the opening day of the new Congress. "I’m proud to be the nominee of the House Democratic caucus once again for speaker of the House," Pelosi told reporters as votes were being counted. A robust resistance movement has demanded a new generation of leadership following a strong showing in this month’s midterm elections, when Democrats snatched the House majority from President Donald Trump’s Republicans. Pelosi needs a simple majority on the House floor -- 218 votes in the 435-member chamber -- to prevail in January. Sixteen Democrats signed a letter this month vowing to oppose Pelosi as speaker. 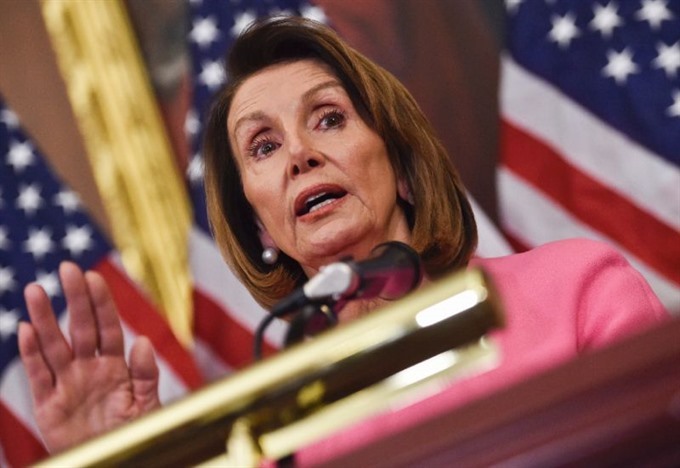 No Republicans are expected to vote for Pelosi, who has been demonized for years by Trump and his party, in large part because she shepherded then-president Barack Obama’s health law through the House to its contentious, historic passage in 2010. Pelosi has negotiated with some of the rebels, placating them with plum committee assignments and pledging to address issues such as gun safety. She cut a deal with congresswoman Marcia Fudge, who was considering mounting a challenge but endorsed Pelosi after the leader offered her the chair of a subcommittee overseeing elections. But two critics who met with Pelosi Wednesday said they remained at odds, and that her speakership quest was in peril. Pelosi, a master legislator and political strategist, played a pivotal role in her party’s winning midterm performance. Should she take the gavel from outgoing Speaker Paul Ryan, Pelosi would become second in line to the president, after Vice President Mike Pence. Democrats, proud that the incoming Congress will be the most diverse ever, made history Wednesday in other leadership elections. Hakeem Jeffries, seen as a rising star in the party, was elected House Democratic caucus chairman. Congress now has two African Americans in the leadership hierarchy -- number three Democrat James Clyburn is the other – for the first time ever. Congresswoman Joyce Beatty said Pelosi is ready to work with Trump, but is also skilled enough to outmaneuver Republicans. Asked whether she envisions Pelosi as a transitional figure in leadership, she recalled how no opponent stepped forward Wednesday to challenge Pelosi.